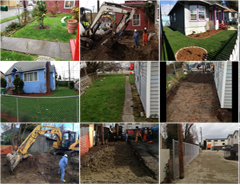 Check out some newly posted before, during and after photos from the Residential Yards cleanup phase (completed in March 2013)! Click on the slideshow on the right side of this page. We will be meeting with residents and business owners later in the spring to discuss temporary and permanent impacts planned for the T-117 neighborhood during the next phase of the cleanup. 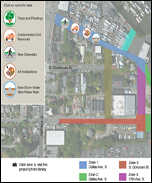 To see the most current design figures for the planned street cleanup and stormwater improvements, click on the first link on the Documents tab on the left side of this page. At the February 5 Design Open House, we were happy to chat with a dozen or so local residents about the plans for the next phase of the cleanup at Terminal 117. A big Thank You to folks for braving the chilly elements that evening and to Napoli Pizzeria for providing such a delicious dinner! 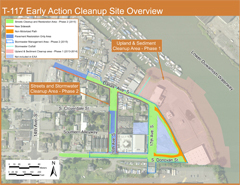 If you would like to see the design details for the cleanup’s streets and stormwater phase, please click on the Documents tab on the left side of this page.